• suitable for DEXRON VI requirements. BIZOL Allround ATF D-VI belongs to the latest generation of automatic transmission fluids based on HC-Synthesis combined with a modern, high-performance additive package. It meets the requirements of many car and automatic gear box manufacturers all over the world. 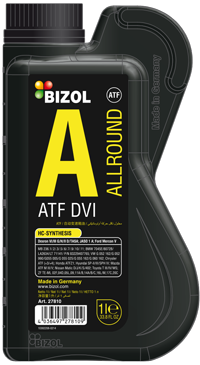 BIZOL Allround ATF D-VI is designed for the use in automatic and manual transmissions, in clutch and power steering systems as well as in hydraulic and auxiliary drive systems in both passenger cars and commercial vehicles. * Viscosity requirements are not fulfilled.